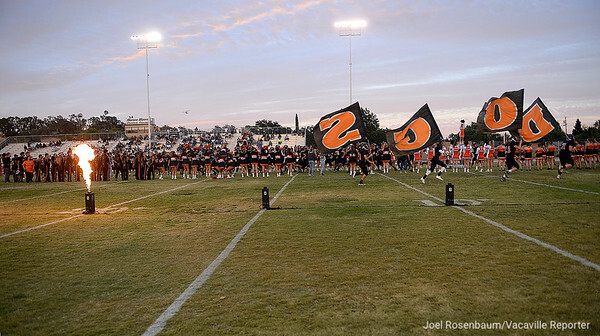 Members of the Vaca High football team run onto the field before their match up against PIttsburg High Friday at Tom Zunino Stadium. 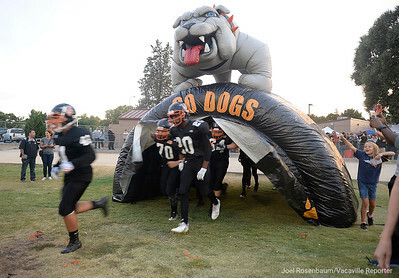 Members of the Vacaville High junior varsity football team carry the Bulldog flags before kickoff of the varsity game against Pittsburg High Friday at Tom Zunino Stadium. 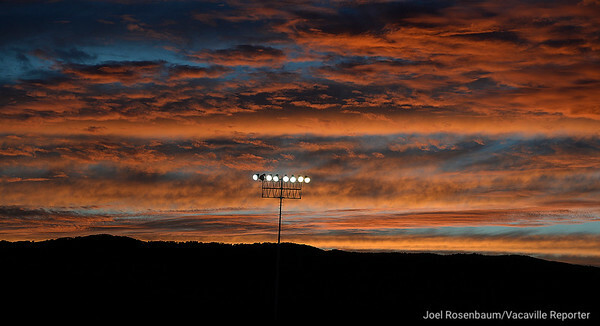 The vibrant colors of the setting sun is reflected in clouds above Tom Zunino Stadium before kickoff of the Bulldogs game against Pittsburg High School. Vaca High running back, Geremiah Brown sprints away from PIttsburg High's Enele Amituanai during the first quarter of the Bulldogs 40-7 loss to the Pirates. 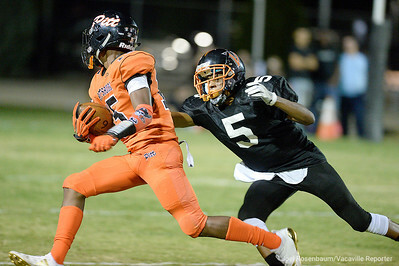 Vaca High defensive back, Myron Amey, tracks down Pittsburg High wide receiver, Justin Boyd during the first quarter. 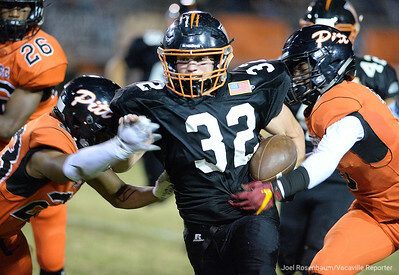 Vaca High running back Talon Abramowicz fights past the defensive pressure from Pittsburgh High’s Eddie Rankin (left) and Willie Harts III during the second quarter of the Bulldogs’ 40-7 loss to the Pirates Friday at Tom Zunino Stadium. Vaca High's Jeremy Villalobos works to tackle Pittsburg High wide receiver, Justin Boyd during the second quarter of the Bulldogs' 40-7 to the Pirates in their final non-league game Friday at Tom Zunino Stadium. 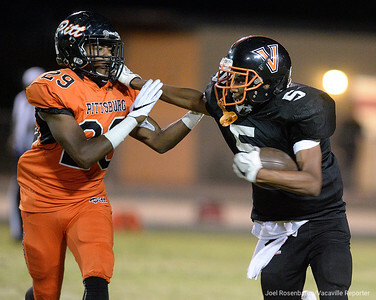 Vaca High's Myron Amey stiff-arms PIttsburg High's Damuarion Harts as he fights for extra yardage as he returns the second half kickoff in the Bulldogs 40-7 loss to the Pirates Friday at Tom Zunino Stadium. 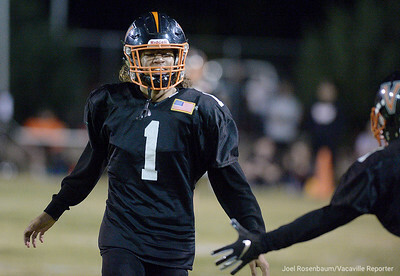 Vaca High cornerback, Michael Briscoe gets congratulated by his teammates after he forced a fumble that saved a touchdown during the third quarter.